These glorious green C9 bulbs bring out the rich beauty of jewels. Not only are they a beautiful Christmas green, these faceted bulbs will shine like emeralds wherever you install them in your decor. To beautify your Christmas tree, combine green and red C9 bulbs. Weave some strings of our clear mini lights alongside for some fun texture. A green and white light combination makes a striking pattern to show off your holiday spirit in your outdoor decorating. Rooflines and sidewalks are showcased with style when embellished with these faceted bulbs, at just over 3 inches in size. These C9 bulbs, which come in bags of 25, are also an excellent choice for wedding receptions, graduation parties and sporting events. Don't forget to buy some extra green bulbs for St. Patrick's Day! We love that these LED bulbs are such an economical choice, with virtually no heat output. This makes them a great choice if you are using large quantities. They are moisture resistant so use them with confidence in both indoor and outdoor applications. These are very high quality LED lights! The faceted plastic that cover the 5 internal LEDs is durable and strong. This color is bright and beautiful. I have these lights paired with Red and Pure White LEDs and they look very nice! I wish they were less expensive. However, I considered this Christmas light project an investment in beauty that I have no doubt will give many years of reliable service. The neighbors all want to know where I bought my amazing Christmas lights. Q: Is the light produced by the LED actually colored green or is the bulb coated in green paint to produce the color? I have had issues with paint flaking off to reveal white light coming out of bulbs in the past. A: These light sets have green LEDs and green polycarbonate lenses. They might start to show their age after exposure to the elements (they edges might look weathered) but they won't flake. Keep in mind that exposure to sun and the elements will take a toll on any kind of bulb - LED or incandescent. 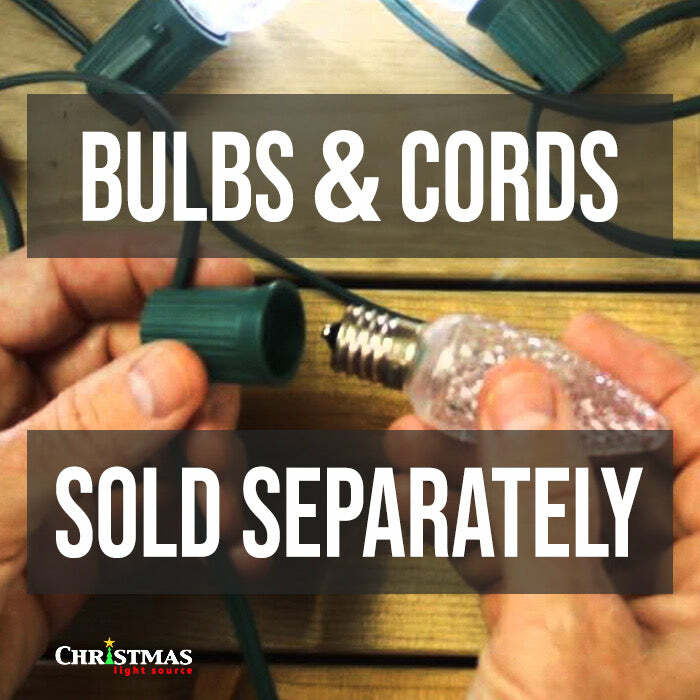 Also consider plugging your LED bulbs into a surge protector to filter out impulses on your electrical lines. LED bulbs are susceptible to damage by impulses in the electrical lines as much as home computers.